Over 36 years as the foremost supplier of cutting-edge technology in the rubber and plastics industries. The intermesh tilt mixer provides similar or better compound dispersion and productivity as similarly sized drop door mixers click here for independent comparison of the two mixer types. The intermesh tilt mixer requires no mezzanine as the drop door mixer, greatly reducing installation costs. In the past twenty years the Dispersion Mixer has become the most commonly used type of mixer in the rubber and plastics industries. 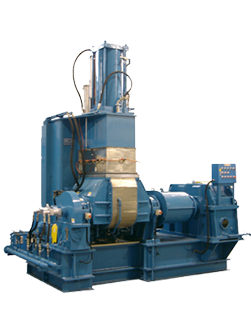 The Kneader tilt mixer with its uniquely designed rotors, rotor blades, mixing chamber and pressure lid allows for thorough material flow and controlled shear mixing within the mixing chamber. 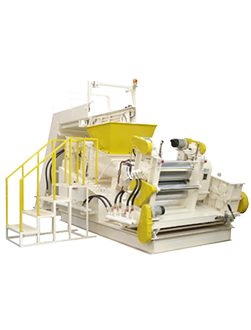 The Kneader conical twin screw dump extruder has a large volume feed hopper which will accept a whole batch from the mixer. 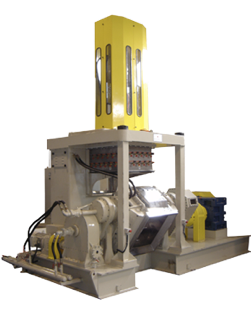 The twin screws continuously and automatically feed the compound, which then is extruded for straining and forming.